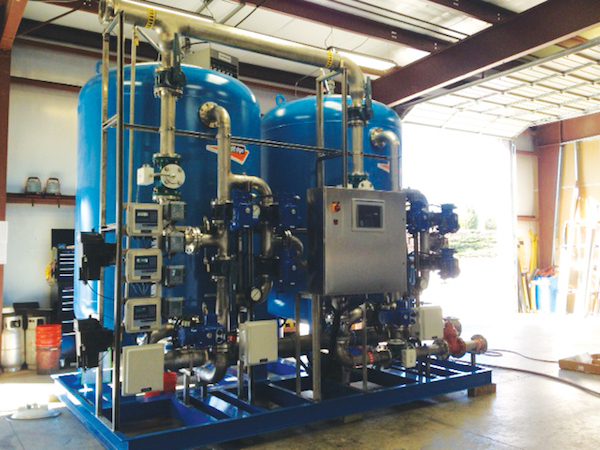 In late 2011, the U.S. Army Corps of Engineers (USACE) approved plans to install a new well and build a new water treatment facility for the city of Roswell, Ga. Barlovento LLC was selected during a competitive bidding process to provide an iron and manganese removal system for the new water supply. The AdEdge treatment system was designed to treat up to 400 gal per minute to serve the water supply wells by removing iron and manganese to the EPA standards. The treatment system was packaged in a compact, skid-mounted unit—AdEdge model APU26-7272CS-2-AVH—utilizing two 72-in.-diameter carbon steel vessels in parallel. Each vessel was loaded with AdEdge ADGS+ media and appropriate support media. ADGS+ is a manganese dioxide coated media used for the removal of arsenic, iron, manganese and hydrogen sulfide. • System control provided by a programmable logic controller (PLC) and a human machine interface screen. The PLC provides control of well pumps and chemical dosing pumps, as well as remote operator plant control. The AdEdge treatment system was commissioned in late 2012. The system has consistently met the effluent treatment goals of less than 0.3 mg/L for iron and less than 0.05 mg/L for manganese since it began operation. To contact AdEdge Water Technologies go to adedgetech.com or call 678.835.0052.